Myriada This was the hat pictured with the Fire Belle costume, so despite the fact that others were available, this was the one I ordered. I could not have been more pleased. I was worried about the fit and such, as I have a small head, but it was just about perfect, and the elastic held it in place discreetly and securely. 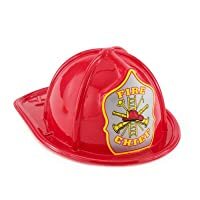 The only negative was that the fire chief logo was a little crumpled at the point on the top, but it wasn't bad enough to be a problem. The plastic itself is kind of flimsy and would probably break if treated carelessly, but it worked out just fine for me. chuggy I purchased these for my preschoolers fire safety unit and they enjoyed them reinacting what they were learning about fire safety. It was great! Hat measures approximately 11" long x 8.5" wide x 4.75" high. Head opening measures approximately 6" wide x 7.5" high.